A Beautiful Granny Bag… It was time for something new!… With all the baby items I made for Alpine Originals last month… And working on my own Sunburst Granny Square Blanket… I was so excited to create something new and different! I love bags and purses! A couple of weeks ago I posted my Market Bags that were made for the shop and this beautiful bag will be making its way to Alpine Originals as well. This purse is made using 13 Granny Squares with the joining method I found at Attic 24, I love all the great info she give us crocheters! I used Caron Pounder in cream as my yarn choice, Bamboo Handle and not showing,,,, A satin liner in Cheetah Print… Super Cute! I have seen tons of Granny Square Bags all over crochet sites lately and was very inspired! I want to make some colorful ones, large ones and small ones, tons of them… This was really a fun project!! 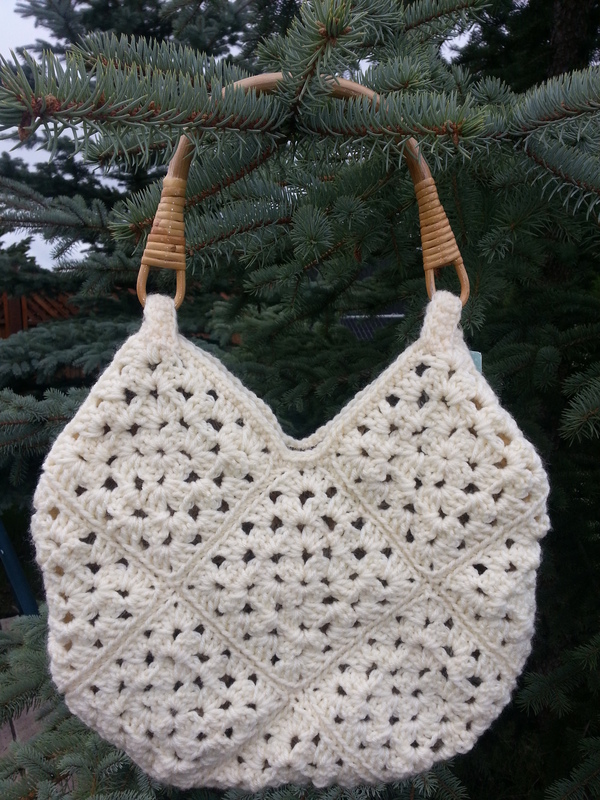 Stay tuned to see what bags come next… And,,, Another Free Pattern is in the works! So here is to more Granny Square Projects, Bags and Purses and Crocheting!